I have been in need of a good mystery for a long time! From the beginning I was interested in Roz's story. She has a vision impairment and struggles with some everyday tasks. The girl is smart and she compensates and gets by just fine. I loved her fighting and "I can do it on my own" spirit! You don't feel sorry for her, but you do commend her for sticking it out and making due with her situation. I hope young readers look at Roz and find inspiration in her story. The mystery behind Tricia's death, a former classmate of Roz', was really interesting and fascinating. There are all sorts of town secrets and skeletons living in people's closets. At any given time I thought the murderer was one of four people. I was looking for the giant in-your-face clue, but Ellen was smart and kept me guessing the whole time. We flash back to the beginning of the school year to the present and try to piece together what happened after this house party. We get to know Tricia, the girl murdered, and she was very difficult to like. Her behavior and antics were sometimes out of left field. I can imagine that she was a fun person to write for. When Roz's lies keep piling up, fingers being to point to her and she has to find out once and for all what happened to Tricia even though several people try to stop her. A mix bag of characters - some you love, some you can't stand - classic who-done-it, and a really intense ending! 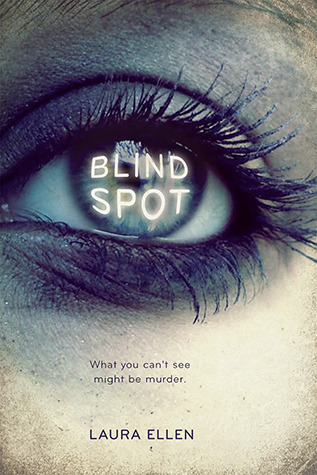 For today’s Blind Spot Blog Tour stop I am here with Jen Bigheart to unveil the stories and winners of the ‘What’s Your Blind Spot’ promotion. For the promotion, I asked readers to share their blind spots with me. I received so many great stories; it was really tempting to post them all. But we don’t have room. Below are the five winning entries (each will receive a signed hardcover of Blind Spot) and some stories from authors who were sweet enough to share their own blind spots. Ever since I was little it has been stressed by my family and teachers that to be successful in life, you have to be successful academically. So, from a very young age, I started studying and reading, doing anything I could do to get an A. And my hard work usually paid off. I got As throughout elementary and junior high school, with the exception of a handful of very disappointing and nearly heartbreaking Bs. High school approached and I started to get anxious. This was where the tough stuff began. I had very few issues my freshman year, the As came quite easily to me. Sophomore year, that was the year I started to sweat. I started having a harder time getting myself to do my homework. I never had the best attendance record, but I was staying home more and more. Somehow, I muddled through and got those coveted As by the end of the year. Next came junior year, with the added stress of looking at colleges. I started the year out well, as usual. But the anxiety came on much faster than in the previous years. By second semester, I was missing weeks of school at a time, feeling all around depressed and anxious, and getting terrible grades in almost all of my classes. The further I got behind, the more stressed out I became. I needed those good grades to get into a good college so I could be successful in life. Isn't that what society had beat into my head since I was an infant? I had to be better, smarter, more perfect than my peers. However, perfection eluded me. I was falling into a depression, my spirits as low as my grades. On February 5, 2012, I attempted to commit suicide. What I remember most is what everybody would say when they thought I wasn't able to hear them. "I didn't see this coming." "I had never thought it had gotten this bad." "I can't believe this happened to her." Each sentence reinforced the notion forming in my brain. I didn't even see it coming. I was too preoccupied with my academics to even notice the effect it was having on me. I never really tried to reach out for help, because I didn't think I had a problem. And I did have a problem. When my daughter Jayla was born, I was so overwhelmed with love for her that I lost sight of practically every other relationship in my life. This "blind spot" was compounded by the fact that I work outside of the home, so in wanting to spend all my nonworking hours with her, I became atrociously bad at returning phone calls and e-mails, and even scheduling priority time with my mom and husband. Jayla's now three-and-a-half, and my tunnel vision has, in all honesty, not gotten much better. Maybe when she goes off to college... :-) - Lindsay Faith Rech, author of It Started With a Dare! “...having a mindset that I am not good enough." Growing up, I had a twin sister who excelled in everything. I was always the one that got a "good" instead of "great". In my mind, she was the light that brought life to Earth. I never felt I was bitter toward her, at least not consciously anyway. At times I was glad I didn't have the expectations weighted on my shoulders. I was never expected to fill her shoes since I am her twins. But it also meant that I was identified as someone's sister, never as myself. I grew up not knowing that I had negative feelings building up inside me. Unconsciously I thought I was not good enough. These feelings, or maybe energy, almost made be lose myself, my individuality, and also my life. My blind spot was my own self, my low self-esteem. I was an object in front of the light. My sister, the light, I, the blocker, created a dark shadow that cascaded my life. I can relate to Roz and her desire to be normal, because I was the same way at her age. No, I’m not blind (though I do have a very strong prescription for glasses! ), but I was always aware of how different my family was from those of my peers. It didn’t bother me that we looked different from everyone else; I was more concerned about the fact that my parents were divorced when I was very young, we were on welfare, and there was conflict at home between my older sister and mom. So I tried to keep it all from everyone at school, even my friends and teachers. For example, one year in middle school, our teacher asked us what presents we got for Christmas. (Who does that, anyway?) After hearing about all the great toys my classmates received, I lied about getting more than I had. Looking back, I regret the exaggeration, which didn’t even fool anyone, because the few gifts that I did receive at holidays and birthdays always cost my mother dearly, and I’m much more grateful for all of them now. The desire to fit in and seem like everyone else had bigger consequences in junior high and high school. During that period, my sister ran away from home several times, and I kept all of that ongoing domestic drama from my friends. The school pressured me into talking to a counselor, but I hated discussing my feelings. Admitting that I had problems meant I had to talk about them, and I preferred to bottle it all up and pretend everything was just fine. When my sister eventually returned home pregnant, I even kept that private. But my two best friends found out about my secret on their own, and they were hurt: For six years, I had never opened up to them about what was going on in my life and the things that were important to me, and I was so caught up in my own problems and hiding them that I barely paid attention to theirs. My friend told me I was just fine the way I was. What she didn’t realize was what I did. I was caught in a spider’s web of lies and secrets already and I couldn’t untangle myself. I was like a helpless fly being preyed upon by a poisonous, deadly spider. The venom had already been injected into me and all I could do was succumb to the pain washing through my body. In less than a week I had stripped away everything I had ever loved and cared for and focused my eyes on one thing only. Nothing else mattered; all I wanted was to be accepted, to fit in, to be like everyone else. Why should I be the one that everyone laughed at behind my back? I was tired of being singled out as the loser and the freak who didn’t know how to dress or have a good time. Did it matter to me that the people I wanted to ‘’fit in with’’ and befriend were in reality totally un-cool, had horrible reputations and were bad influences on everyone within a three mile radius? No. Every time they looked at me with that smirk on their faces another part of my heart crumbled to pieces inside my chest. I was breaking like a glass jar and scattering jagged pieces wherever I went. All I needed to do was piece myself back together. I can relate to Roz and her desire to be normal, because I was the same way at her age. No, I’m not blind (though I do have a very strong prescription for glasses! ), but I was always aware of how different my family was from those of my peers. It didn’t bother me that we looked different from everyone else; I was more concerned about the fact that my parents were divorced when I was very young, we were on welfare, and there was conflict at home between my older sister and mom. So I tried to keep it all from everyone at school, even my friends and teachers.. But my two best friends found out about my secret on their own, and they were hurt: For six years, I had never opened up to them about what was going on in my life ….I was so caught up in my own problems and hiding them that I barely paid attention to theirs. Thank you so much everyone who participated in this promotion. If you you’d like to share your own blind spot story, go ahead and leave it here on the comments or over at the Blind Spot Facebook page. I am leaving a bag of Blind Spot swag (signed bookmarks, a notebook, and magnet) with Jen to giveaway (US/CANADA only), and I am also giving away two signed hardcovers of Blind Spot over at my website. Before I go, let’s announce the Blogger Love winner for today. Congratulations to YA Book Season, you’ve won a bag of swag from a ton of debut authors plus your choice of either a blog button/badge designed exclusively for you by Giselle at Xpresso Design ($15 value) or a book of your choice!